On this date in 1888, after a hearty breakfast of beefsteak, eggs, sweet potatoes and coffee, William Showers became the eighth man judicially hanged in Lebanon County, Pennsylvania. Bill Showers was a widower by then. For about six months, with the help of his son and his daughter-in-law, Showers did the best he could to provide a home for his grandsons. But in April 1887, Showers’s son and his wife stopped helping him care for Willie and Sammy. Bill had never wanted the boys in the first place, and he couldn’t afford to feed them on his own. For about a month the three of them lived alone and Bill tried to get someone to take the children off his hands. He tried a few different foster homes, but he couldn’t afford to pay the foster parents for the boys’ keep. He took them to an orphanage, but they were refused admission. The county almshouse rejected them also. In mid-May, however, Showers’s normally sulky and reclusive attitude suddenly changed and he went to the neighbors and cheerfully announced that he had finally found another home for the children. Two brothers in Schuylkill County were willing to adopt them and take them to Texas to start a new life, and they would be out of Bill’s hair forever. Showers asked his daughter-in-law to mend the boys’ clothing in preparation for their journey. Then, on May 17, he borrowed the local minister’s buggy and set off over the mountains to Sammy and Willie’s new adoptive home. A few of the neighbors noticed Showers riding out of town that morning. They also noticed that he was alone. By May 30, the good citizens of Annville were suspicious enough to go to the local constable, Joseph Fegan. When Fegan questioned Showers as to the whereabouts of his grandchildren, Bill told them a most extraordinary story: on the way to Schuykill County, he said, he’d encountered two black men and asked them for directions. No one believed this wild story, and the people of Annville organized search parties to look for the two children, whom they were sure had been murdered. They found their tiny, nearly naked bodies that very same day, in a ditch only about 70 yards from Showers’s house. They had both been beaten and strangled to death. Showers was arrested, charged with murder and lodged in the county jail. Which was just as well for him, because his neighbors were inclined to lynch him. His son hired a very able local attorney, Frank Seltzer, to defend him. Seltzer selected Frank Lanz, a former state senator, as co-counsel. The Commonwealth of Pennsylvania charged the defendant only with the murder of Willie. The idea was that if they lost that case, they could go forward and try Showers for the murder of Sammy. Seltzer…had a different view of the situation. He rose and objected to the call of the case with a voice that could be heard in the county jail one-half block away. Promptly and resignedly, his tone of voice changed. As if explaining a baptismal font to a heathen, he told the judges that he and Senator Lantz had been retained for less than a week. Their request for a continuance was not made :in the spirit of vexatious delay” but rather for lack of time to prepare the case for trial and, of prime importance, the inability to have a fair trial in the county at the time in light of the prevailing rumors. Adverse pretrial publicity, pleaded Seltzer, rendered a fair trial impossible at this time. [The prosecutor] Ehrgood replied to Seltzer that he had been given prompt notice he was going to press for immediate trial and Seltzer would have ample time to prepare, since it was only Monday and he would not be ready for trial until the following Thursday. This was a concession which Seltzer and Lantz hardly appreciated. 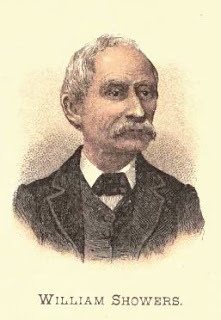 Seltzer murdered his wife in 1886. He also killed his daughter Sara, Willie and Sammy’s mother. He was in love with a local seamstress, Elizabeth Sargent, and killed his family members to get them out of the way so he could marry her. The press didn’t help matters. During the summer of 1887, Showers’s attorney, Seltzer, fell ill and was confined to bed, unable to assist with the defense. It seemed unlikely that the trial would really take place in September. Perhaps Showers couldn’t stand the suspense anymore, for on September 23 he summoned his sons Stephen and William Jr. to the jail, along with the lawyer Luther F. Houck. Showers made an oral confession to all of them, speaking in his native German, and Houck wrote it down and translated it into English. The substance of Showers’s confession was that Elizabeth Sargent had agreed to marry him on the condition that he got rid of the boys, and they had agreed to kill them. Elizabeth, he said, helped him strangle Willie and Sammy and dump their bodies in a pre-dug grave. In court later that day, Showers pleaded guilty to both murders, and his confession was read out for everyone to hear. Elizabeth Sargent was in the audience and she leaped up and shouted, “That’s a lie!” The judge had her removed from the courtroom. The next day she and her parents took a train out of town. Because Showers had implicated her and the police weren’t sure as to whether she was involved in the children’s deaths, the court issued a bench warrant for her arrest. The townspeople, however, didn’t believe Showers’s second story any more than they had his first one. They were convinced of Elizabeth’s innocence. She subsequently reappeared and presented an alibi, proving she had not been with Showers on the dates he specified in his statement. When he heard the news about his client, Selzer rose from his sickbed and rushed to court to try to undo the damage. He begged the judge not to accept the guilty plea. In private, Showers told his attorney the confession was completely untrue and he made up the story because he’d been sick and weak, and people who visited him in jail told him he would be hanged if he didn’t own up to what he did. Selzer’s argument persuaded the judge: Showers’s guilty plea was withdrawn. He finally went to trial on December 15, 1887. He testified on his own behalf and gave yet another bizarre story, this time implicating a local man named George Matterness and his dead daughter Sara’s husband, a man named Huffnagle. He said Matterness and Hufnagle, along with two other men in blackface, had visited Showers’s home on the night of May 17 and lead Willie and Sammy out of the house. Matterness, Showers said, had later told him the children were buried in the ditch. Showers had told no one about this before because Hufnagle had repeatedly threatened his life. The prosecution immediately called George Matterness as a rebuttal witness. Matterness, a teacher, freely admitted he knew Showers slightly, but said the whole story was a lie and he was baffled as to why the old man would have implicated him. Given the circumstances, it’s surprising the jury actually deliberated till midnight and then on to 8:00 a.m. the next morning before pronouncing Showers guilty. He told Seltzer, “I’m glad they didn’t find me innocent so they can’t go ahead and try me on the indictment for the murder of Sammy.” He expressed hope that he would prevail on appeal, but the Pennsylvania Supreme Court denied him and the governor quickly issued a death warrant. The morbid mass got its wish. The small, slight man fell only three feet, and his neck was not broken. He strangled slowly for seventeen minutes. As Showers’s sons all refused to take custody of the body, he was buried on the grounds of the county almshouse. This was the same institution that had refused to accept his grandsons, an act that would have saved their lives.